Home > Posts > News > Economic life > Lyon, the second most visited city in France…and so much more! 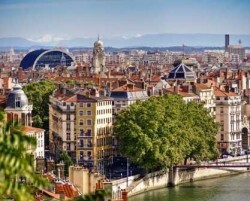 Having been classed Frances #1 city for culture after Paris 1 , Europe’s #1 destination for a city break 2 and having and the 3rd most popular destination among international tourists 3, Lyon is now officially the 2nd most visited city in France according to the SeLoger.com survey! With 6 million tourists each year, the capital of the Gauls is just behind Paris (30 million tourists) and in joint second with the city of Lourdes. So what attracts tourists to Lyon? Its charm and the quality of the culture it offers: its culinary and artistic culture, and its heritage. The city offers an abundance of things to see and do for all tastes. As for taste, Lyon attracts many tourists with its bouchons, or traditional Lyonnais restaurants, but also for its Michelin star chefs, such as Paul Bocuse, who have left their stamp on the city. In terms of the heritage, Lyon is one of France’s oldest cities and it is a UNESCO World Heritage Site. Fourvière Basilica, the Gallo-Roman theatre, the old town with its bustling slopes. The city hosts numerous artistic national and international events throughout the year, with a such as the Nuits Sonores electro music festival, the biennial contemporary art festival, the biennial contemporary dance festival, and the Festival of Lights which draws 3 million visitors each year. However the city doesn’t only attract tourists! Indeed, Lyon also attracts professionals and businesses: it is the most attractive city for exécutives 4, and among the 15 most attractive cities for foreign investment 5 . Furthermore, the city’s dynamic economy makes it an ideal place to develop a company. As well as its sectors of excellence, it also attracts people through its accessibility; located ideally in the heart of Europe, its wealth of talent of its capacity for innovation. Each Year, Aderly helps companies with their projects to set up in Lyon; the city’s great appeal helps to increase the number of companies set up and jobs created.